Okay so, not the best finale of a television show I’ve ever seen. Is it terrible? No, not quite. But it’s disappointing in the grand scheme of things, and just makes me all the more excited for a season two. With “Daredevil” it felt as if there was uncertainty amongst the showrunners about whether or not they’d be getting a season two so I tried to cover all of their bases and wrap their stories up just in case to give some closure. The result is something a little rushed, a tad hackneyed, and not altogether that exciting for what should be the climax of the series but, luckily, the show has instilled enough good faith up until this point that it’s easy to not be too let down. The entire montage where all of the crooked cops, and other swayed officials were captured and brought to justice was too grandiose. It was too big for a show that has built itself on realistic action sequences and intimate character growth. The music, the slow motion arrests-all of it built for a scene that was a little too heavy handed. The in-between period when our leading heroes celebrated while Fisk was carted off to prison before breaking out. Fisk had a nice speech in the van where he talks about his sense of self, his belief that he was on the side of the good before realizing that he’s been on the other side for a long time now-this is all great and leads to one of the few sequences of the show where Fisk feels like Kingpin. Too bad it also allowed Matt and co. to be painted as ignorant, not anticipating that Fisk could have collateral plans. Forcing Marci and Foggy together isn’t a bad idea on its own because having other female characters on the show is never a bad thing. I’m not sure I like the idea that it was done solely to open up the possibility for Matt and Karen, a pairing I’ve yet to buy due to the two actors sharing little romantic chemistry. 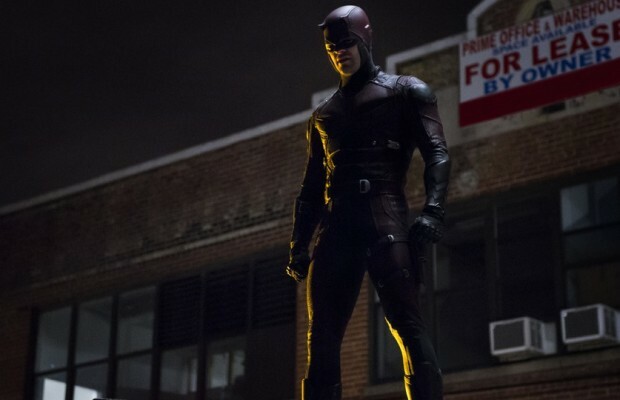 The biggest moment of the episode is clearly supposed to be when Matt debuts in his new Daredevil suit that has the works; it’s red, has the horns and is made of body armor that will protect him far more than his previous attire. And while I’ll go ahead and say I’m definitely more inclined to the all-black outfit, it’s still a pretty neat hero moment for the character. The body of the suit looks terrific so here’s hoping that one of the goals for season two can be creating a mask that doesn’t squish his face so much. The aftermath of Ben’s death and his funeral was all handled well with Matt and Karen both dealing with their grief in honest ways. Foggy and Matt’s reunion! They can’t go back to where they were but they can move forward. Having cemented them as the true heart of the show I’m very excited about this development. Seeing Foggy grapple with how to deal with a friend who’s a vigilante while also being his partner in more interesting than Foggy being grumpy about the whole thing. The avocadoes at law at the end was a nice touch. The fight scene between Fisk was fittingly brutal with Fisk drawing as much blood from Matt as Matt does in return. It’s the fight scene we’ve been waiting for this season and it comes with just the right amount of emotional significance. The ending pose! Listen, sure, it’s a little on the nose, but Matt’s jump from the rooftops as he goes to fight crime was wonderful. It was a true comic panel grab. The show obviously loves the comics and have gone out of their way to make sure Daredevil fans old and new would be satisfied. I could likely just say “Thank god there’s a season two coming in 2016” and feel content with my declaration but I’ll be a little wordy. It’s still fresh in my mind so maybe I’m saying this due to the “new factor” but Daredevil could very possibly be my favorite thing that the MCU has done. Matt Murdock is certainly my favorite hero thus far to come from the universe, and I’m a pretty enthusiastic Tony Stark, Steve Rogers and Black Widow fan. The characterization of the villain, the focus on the heroes internal struggles as well as physical shortcomings, how Hell’s Kitchen came alive as its own living and breathing character all helped elevate the show into something special. The fight choreography is some of the best I’ve ever seen, the performances (by Charlie Cox, Rosario Dawson and Vincent D’Onofrio in particular) are strong and it allowed us to peek inside the origin story without it becoming the sole focus. It was exciting, it surprised me and it was a fun watch that pushed the envelope of what Marvel has been doing. It had its weak spots, sure, but when it was at its best such as the stretch between episodes five and ten, it was a force to be reckoned with, much like the hero of its story. I can’t believe I’m already done with the reviews! Now bring on season two 2016! I’m ready.